The American Metalcraft CH6 number card holder makes seat and table assigments more visible to customers and staff members since it is 6 inches tall. Its wire loop clip holds cards securely and the weighted base supports cardstock. 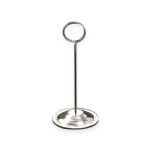 Constructed of stainless steel, the holder is durable and easy to clean. 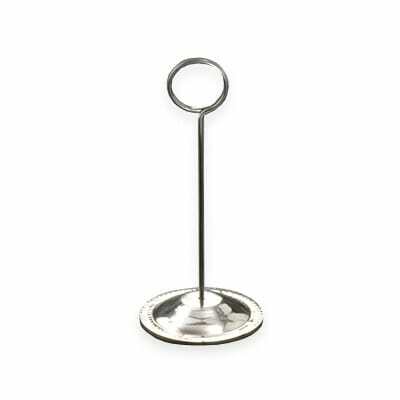 The American Metalcraft CH6 number card holder’s polished finish looks great on any tabletop. "We are not a restaurant but we ordered these card holders that were perfect to denote the tables for our exhibitors. They're light but sturdy an..."
"We are not a restaurant but we ordered these card holders that were perfect to denote the tables for our exhibitors. They're light but sturdy and with a nice card-stock sign in them, make a perfect way to save tables for organizations."